The Stanley Cup will be in the building in Pittsburgh for the 2nd time, but it'll be the first time in the Consol Energy Center and the first time with the Penguins having a chance to win it. They'll have a chance to life the Cup in front of the home fans for the first time due to their work on the road, splitting a pair of games in San Jose and nearly winning them both before falling short in overtime of Game 3. A win tonight will cap a remarkable turnaround with a championship few could have predicted in December, when the Pens made the change at head coach, getting rid of Mike Johnston and replacing him with Wilkes-Barre head coach Mike Sullivan. Sullivan has played a huge role in turning around this team and their season, and they wouldn't be in this position if not for him. Phil Kessel has been a key performer all through the postseason, and his 10 goals and 21 points lead the Penguins, making him one of the favorites for the Conn Smythe Trophy. Another surprising contender is goaltender Matt Murray, who managed to grab hold of the starting job with his strong play during the first two rounds. Marc-Andre Fleury did start Game 5 against Tampa Bay after Murray struggled to start the Eastern Conference Finals, but he's been solid since and sports a 0.925 SV% and 2.09 GAA in 19 postseason starts. Of course, Penguins captain Sidney Crosby remains in the conversation, and while he hasn't filled the scoresheet like he has in previous years, the Pens haven't needed him to either. He's currently tied for 2nd on the team in scoring with 17 points (6g, 11a), a mark he shares with Nick Bonino (4g, 13a) and Evgeni Malkin (5g, 12a). Pittsburgh's big names have helped lead the way, and San Jose will need the same if they're to stave off elimination. Though Joe Thornton and Joe Pavelski have done a great job driving play on the Sharks' top line, they haven't been able to translate that into points on the scoresheet as Pavelski has been held scoreless and Thornton has only a pair of assists. Brent Burns chipped in 75 points from the blue line during the regular season, but he too has been held relatively quiet in the Finals with only two assists. If the Sharks are going to force a Game 6 in San Jose, they'll need their big guns to start finding the back of the net. 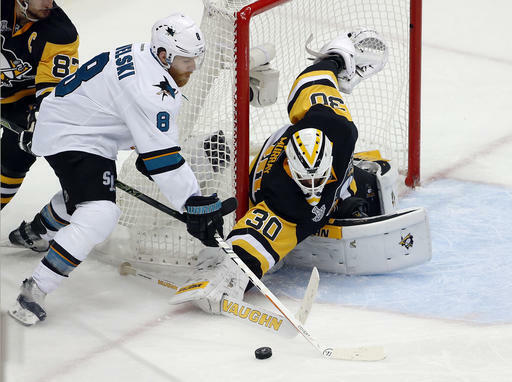 - The Sharks have led for 0:00 of the Stanley Cup Final, with their win in Game 3 coming during overtime. If the Penguins win Game 5 without surrendering the lead, they'll become just the third team in NHL history to win the Cup without trailing in the series. - The Penguins have an all-time record of 10-3 at home in Stanley Cup Final games, and they've had a strong showing at home in the 2015 postseason as well, setting a franchise record with 13 home games and tying a record with 9 home wins.